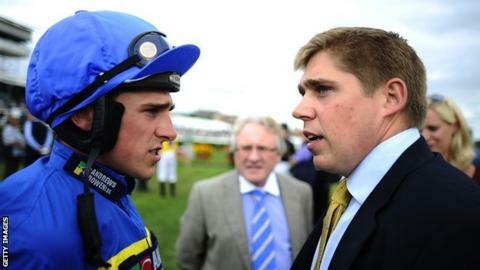 It is a credit to the all-round skills of Dan Skelton during his short, but already burgeoning training career, that he has not become public enemy number one among his colleagues. As the new kid on the block, the long-time assistant to champion Paul Nicholls has taken delivery of more than a few horses moved from other stables to his new base in rural Warwickshire. And to make matters potentially all the more awkward, many have found a speedy route into the winners' circle for their new trainer and his jockey younger brother Harry. One, What A Warrior, formerly with Nigel Twiston-Davies, lines up for Newbury's £175,000 Hennessy Gold Cup, one of the highlights of the jumps season, off the back of re-capturing winning form at Ludlow and then Ascot. Yet racecourse chatter about the success of Skelton, 29, son of Olympic gold medal-winning showjumper Nick, is generally much more of an admiring nature than resentful. "I've never asked for a horse and never will," said Skelton diplomatically, "and I'd like to think that I've conducted myself professionally. There hasn't been any fall-out. "Everyone hopes and dreams that their horse is fractionally better than they are, and when you're relatively new, a few owners ring in the summer and ask you to have a go. "Things have been working out, but they will only go on so long because someone else will appear soon." After nine seasons based with the Nicholls team, and with the backing of his father, Skelton started up at state-of-the-art Lodge Hill, set in 90 acres of countryside close to the market town of Alcester. The current campaign, for which he has 65 horses to run, is his first full one, and already the stable's tally has passed the total it achieved during the three-quarters of last season that it was operating. While he describes the years with Nicholls as "the best grounding possible", such a glittering CV brings with it high expectations and, I'd imagine, consequent extra pressure. Skelton said: "In the first six months I think I was too busy to worry about external pressures to be honest. "But I suppose when you're around a great big team like Paul's, some people may wonder if there isn't a certain element of being carried, that you were luckier to be in the job than the job was lucky to have you. "Of course, the first winner was very satisfying, and it didn't come straightaway. "I'm ambitious, but I'm not getting carried away saying I want to be champion trainer or making other goals. I just want to keep on competing in big Saturday races, and landing one or two." Among What A Warrior's opponents are two representing Nicholls, who has taken the prize three times as a trainer - with Strong Flow (2003) and Denman (2007, 2009) - and twice as a jockey, on Broadheath in 1986 and Playschool a year later. Both of Nicholls' Hennessy runners, Rocky Creek and Unioniste, were with the champion trainer during Skelton's time assisting him, and the irony of regular competition against his old boss's runners is not lost on the young trainer. Describing their relationship as "very amicable rivalry", he said: "I still talk to him twice, three times a week. I ask for advice, and he's been very, very good to me - I know that - and there are going to be days when I win, but a lot more days when he wins. "It made me laugh when you were all writing that Paul Nicholls was having a slow start to the season, and I thought 'don't rev him up, don't rev him up', because if he's irritated, it'll all come right quicker and I'm up against him now." What A Warrior is about 20-1 in the betting behind the Willie Mullins-trained favourite Djakadam for the three-and-a-quarter mile Newbury feature. Skelton added: "I think on his day, given his conditions, he could be a 150 horse [currently rated 142]. He's trying a new distance and is up in the weights, but hopefully he still has handicap potential." Coverage of Hennessy Gold Cup day at Newbury on BBC Radio 5 live with the feature race at 15:00 GMT.